I confess to a tiny bit of pride when Evie broke her right collar bone. I knew what to do. She’d broken her left one a year earlier. In parenting, one is rarely so fortunate. I know, it sounds coldhearted to talk about a repeated injury as a fortuitous event, but parenting rarely affords the opportunity to use what you’ve learned. As a parent of two children, I would have thought the expertise from Bryce would have helped with Evie. But other than the truly generic, (diaper rash, teething, skinned knees, the miracle of Ibuprofin) they had the gall to be complete individuals whose parenting required genuinely unique skills. Bryce’s complete apathy for choral singing did little to prepare me for Evie’s passion for it. His model-worthy teeth left me shocked at her glaring need for orthodontia. I knew I was parenting a one-of-a-kind kid. Teaching is different. 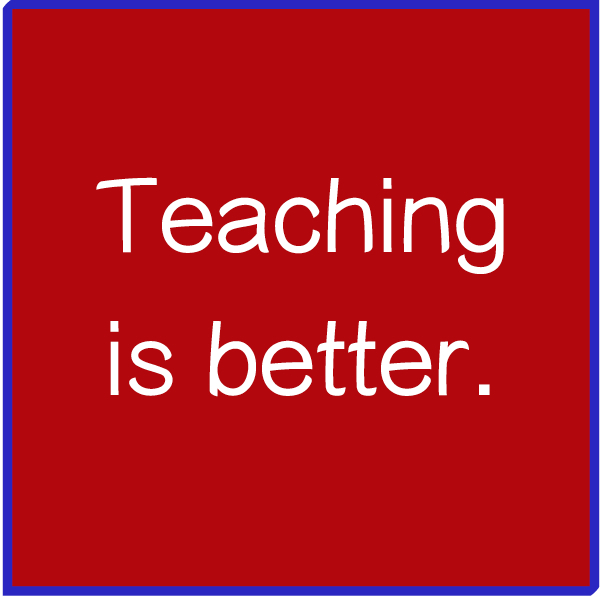 Teaching is better. It gives me a chance to use what I’ve learned. What I've become an expert in. It’s as if I get the chance to help every student through their broken collar bone, their molecule modeling, their need for orthodontia. You might want to check out Tools for Teachers. Did you get a Ladybug yet? It might be a floppy fifth finger, an unstable sense of rhythm, a wild case of ADD, but as I venture bravely through middle-age I love getting to do things over again. And again.